The William Morris Gallery is an amazing gallery in North London, which has just been renovated to display over 10,000 objects about the life and work of Morris and his artistic circle. 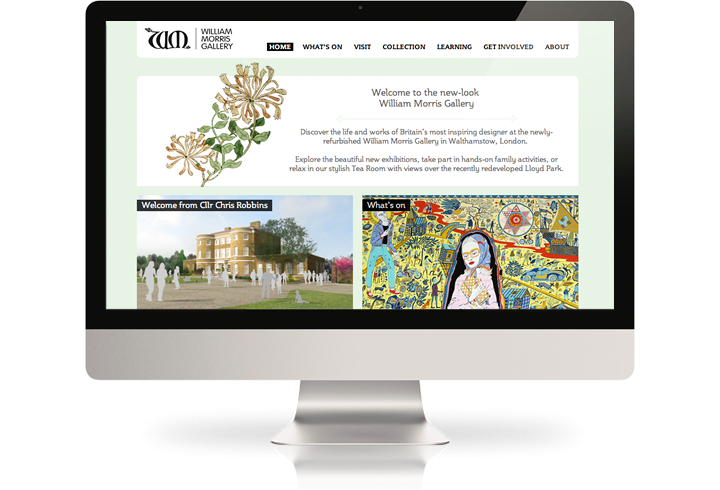 The website is part of the Museums Sites family, combined with a unique design some bespoke functionalities. The Qi CMS is used as Collection Management as well as Web Content Management. 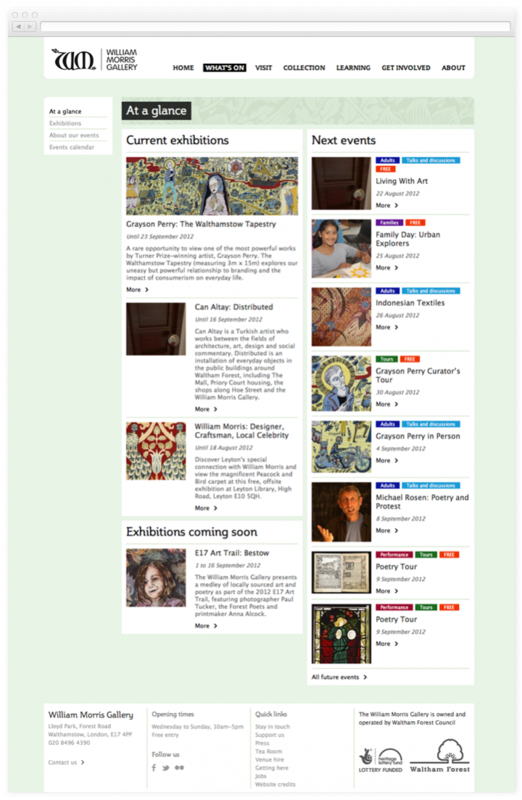 The collection home page offers a unique approach to engaging different types of audiences, from casual browsers to arts and crafts scholars and experts. The standard index page has been extended for an even increased flexibility. 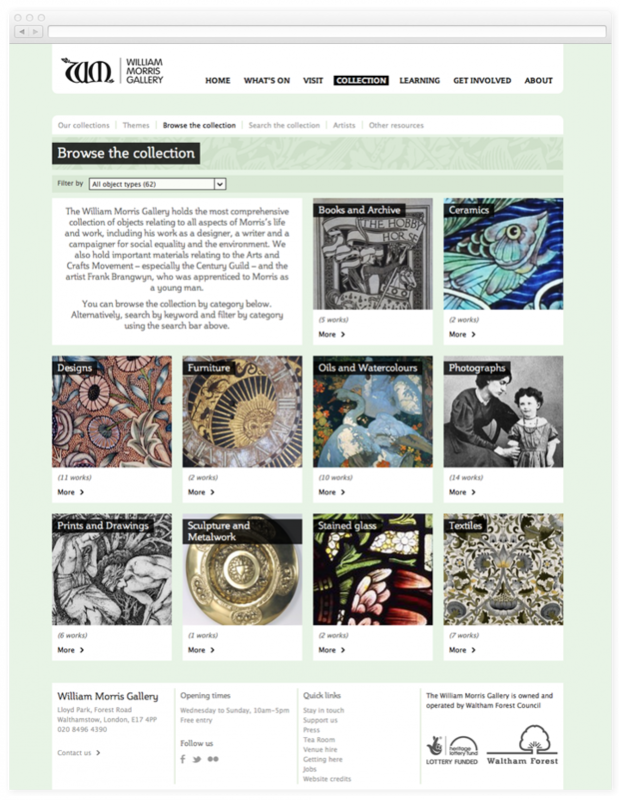 The work of William Morris encompassed many disciplines - which are all represented on the initial screen when visitors browse the collection. Visitors may choose the type of content that engages them and then filter results. 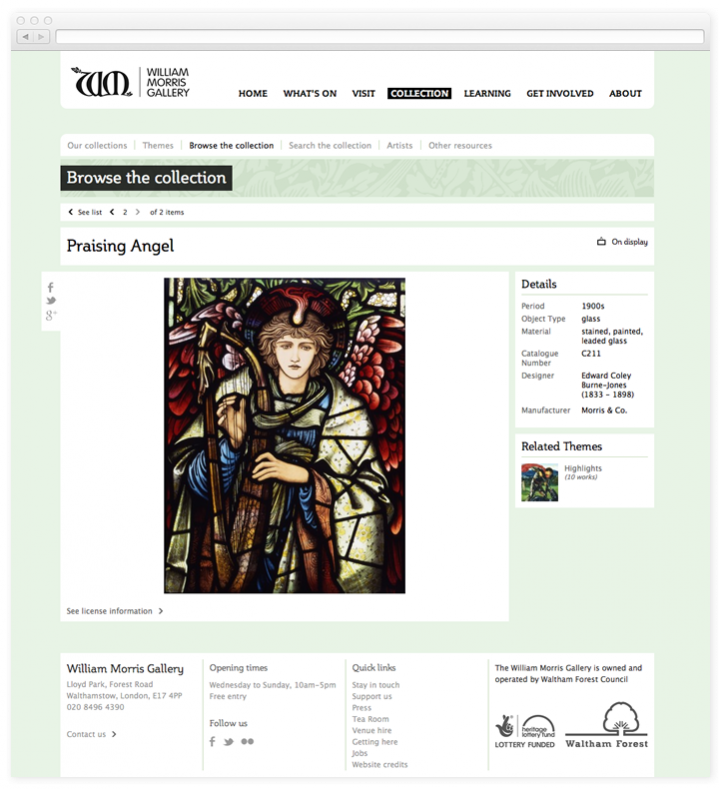 The gallery is blessed with amazing objects and amazing reproduction, so in the interface we made extra space to display large images and still leave enough space of details and narrative content. Themes are an essential part of the strategy to make collection content accessible to diverse audiences. 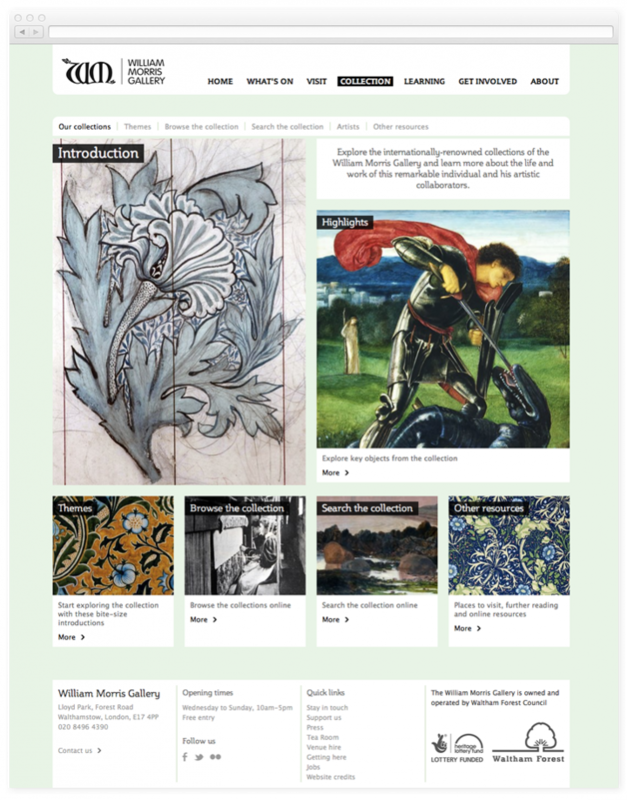 In the William Morris Gallery website themes link together works from the collection, with a dedicated narrative trail - to introduce a topic and show contextual examples. The gallery is housed in a beautiful, newly renovated building, which was the former home of William Morris in Walthamstow. The website offers multiple ways to showcase the various aspects of the building, from the displays to the cafe. 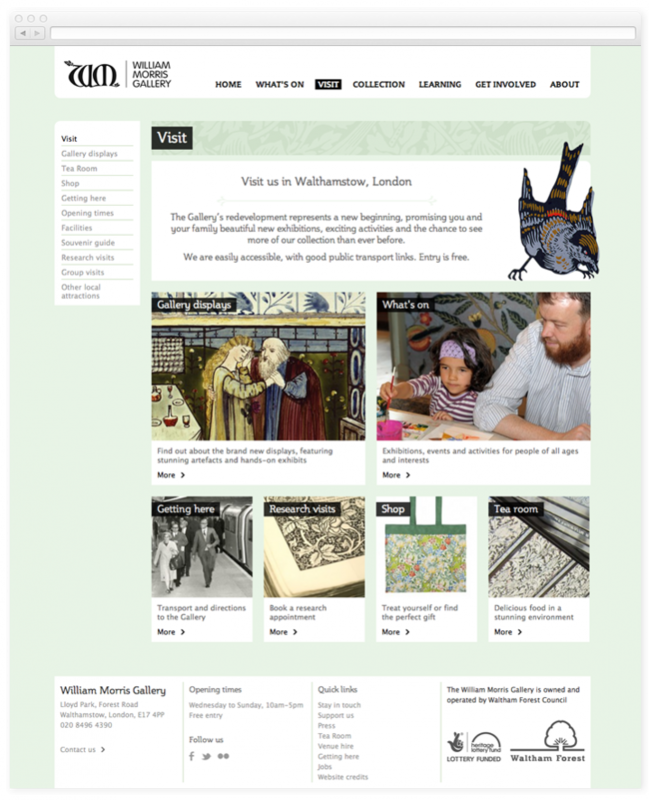 While usually Exhibitions and Events have a different level of importance in a traditional museum, for the William Morris Gallery they have the same weight. We customised the What's On template to allocate equal space to both. Mobile, mobile, mobile. Museum traffic from mobile is increasing at an exponential rate, with major museums now claiming up to 20% of their visitors come from a smartphone. 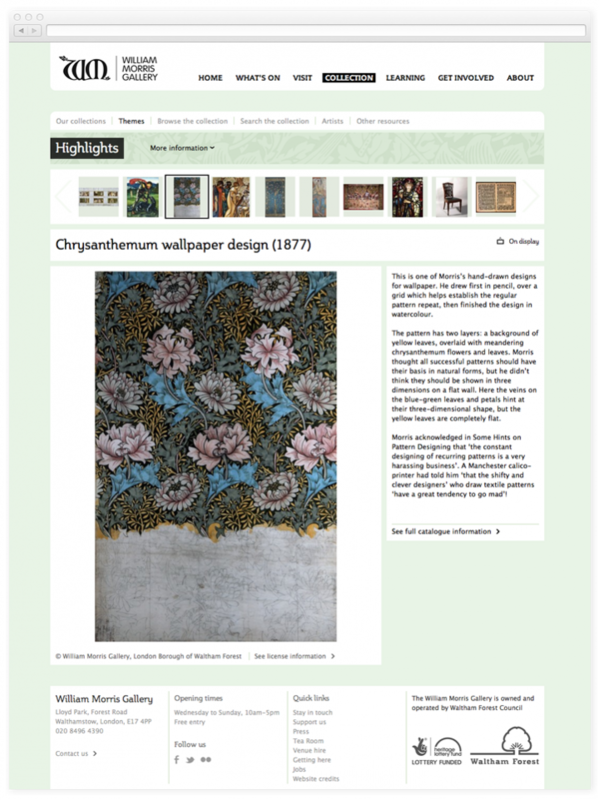 As part of the Museums Sites family, the William Morris Website enjoys fully dedicated mobile templates for each and every page.